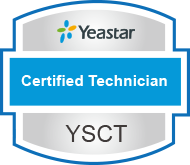 Training is performed in-house at Aristel, and also online as part of the Yeastar Academy, as a Yeastar Certified Technician. To commence training in the S series PBX, a product pack may be purchased for a discounted price and used to learn in a practical training session. Training varies in length based on the type of training required. S series training and Neogate gateway training generally takes two days.